Start and End Dates: This is the expected date and time for which the session will take place. Usually this will correlate to the in person training session. When a trainee registers for a session, they will be sent a calendar event for that session with these times. Places available: This allows you to restrict the number of trainees that can register for this session. Please note that this limit does not apply when an admin manually assigns a session to a trainee. Instructor: The user who will run the session. This user will need to be an Administrator or have the instructor role in the Velpic platform. This user can also complete the session. Session Notes: Extra information which is visible to a trainee when they have signed up for the session. 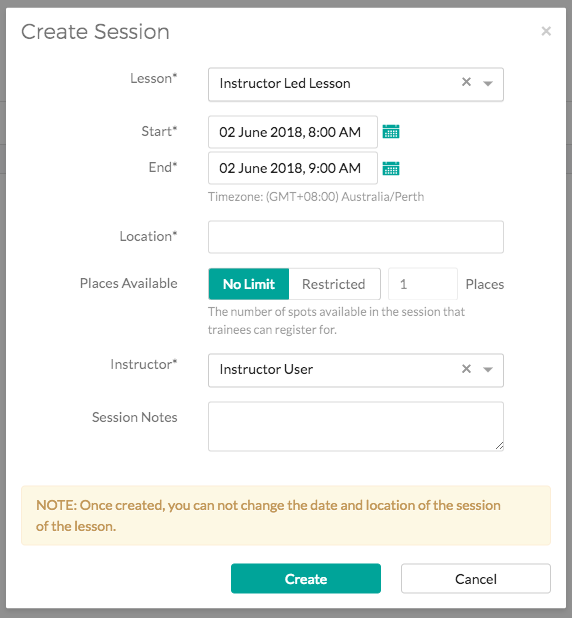 Once you have set these options select "Create" to create the session.